What are those two relays sitting above the radiator shroud on your XJS? What do they do, and how do they do it? Those are the questions I hope to answer in this brief technical note. The pair of relays are alternatley known as Anti-Stall or Idle relays, which describes their function, in part. In the most basic of descriptions, they're present in order to ensure your engine does not stall out when the A/C is running and the engine is idling. In other words, they're an idle stabilization circuit (though they're not idle feedback based -- if you have an erratic idle, these guys are not likely to be to blame). When the AC compressor is in operation, the supplementary air valve (SAV, also sometimes referred to as the "Extra Air Solenoid", which is on the A-bank air cleaner, and is not to be confused with the AAV which connects to the rear of the B-bank intake) is opened via the idle relay to stabilize the idle speed (due to the slight additional load of the AC) by allowing a little more air into the intake BEHIND the throttle butterflies. To prevent excessive idle speed in the absense of engine load, the idle override relay is energized when Neutral or Park is selected. When energized, the idle override relay switches the ground source OFF to the idle relay, thereby closing the supplementary air valve (SAV). The gearbox switch is closed (provides ground) when the gearshift selector is in Park or Neutral. This is the same microswitch used by the starter relay for providing in-gear starter lockout, though it is separated from the starter relay by a diode (not shown here). As a result, RL1 engages only when the car is in Park or Neutral. The circuit is partially diagrammed in the Electrical Guide supplement. In my edition, it appears in figures 25.1 (schematic) and 25.2 (location), where the relays are referred to as the Idle Override Relay and Idle Relay. RL1 is in a BLUE socket, and is the "Idle Override Relay", although cars which have been retrofitted using the JLM832 Anti-stall kit may have a RED socket instead. 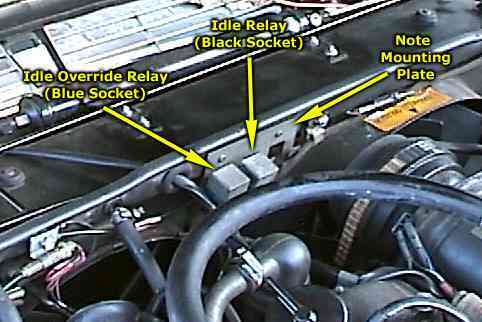 RL2 is in a BLACK socket, and is the "Idle Relay". The JLM832 Anti-stall kit was apparently (as far as this author cas come to determine) introduced as a retrofit component for model year 1985 cars. Presumably, post-1985 cars may have had this installed as factory hardware. The retrofit may work on earlier models (I don't see anything in the wiring which would prohibit it). Although the photograph above shows the relays above the aux fan, the relays, if installed as a retrofit (the JLM832 kit), might not be installed there - apparently instructions called for it to be installed on the inside front fender well - even through the radiator crossover plate on the author's own 1985 clearly has the two holes on which the bracket mounts in later years. In fact, the author's own 1985 is NOT fitted with these relays, whereas his 1988 came with them factory fitted (as seen in the photo above). According to the diagram, there should really be only five wires which run from the locality: a Green/Red to the Air Conditioner Clutch Relay, a White from the Ignition Switch, a Pink/White through a Diode and off to the Solenoid Vacuum Valve (SVV, which is located to the rear of the A bank intake manifold), a Yellow/Black off to the Supplemental Air Valve (SAV, which is under the front of the A bank air cleaner main housing - it is the bugger that plugs into a hole on the filtered side), and a Green/Black to the Gearbox Neutral switch (in the console, mounted on the gearshift selector). The 45 second timer unit is in the auxilliary component panel (passenger footwell). Kirby Palm's Book Experience in a Book (affectionatley referred to as THE BOOK by Jag-Lovers listers) has a description of the circuit under "ELECTRIC AUXILIARY AIR VALVE" (circa page 182 on the DEC 1999 edition which I refer to frequently), though it calls them by the name "idle relay" rather than "anti-stall" relays. p86A-60 shows the locations on an overhead silouette, as components 9 and 10. Note that North American cars likely will not have the two adjacent relays (one of which is actually a diode pack), which are for headlamp wash/wipe, which are not fitted in this market. These are not shown in the above photo for this very reason.